Diesel in Delhi is being retailed at Rs 75.46 per litre and Rs 77.31 per litre in Kolkata. 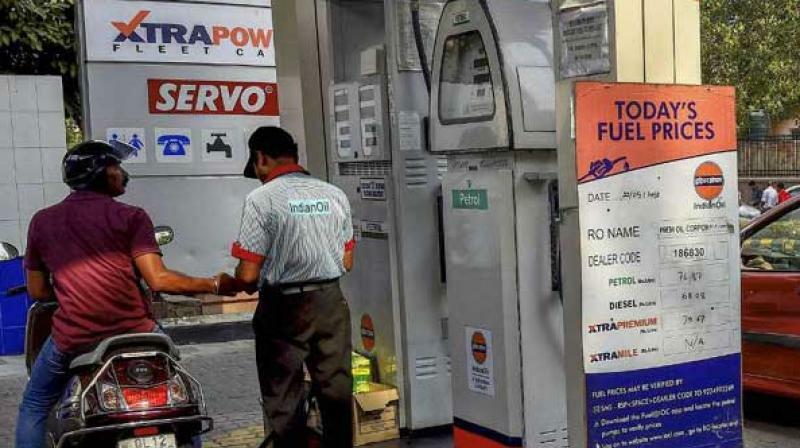 New Delhi: Fuel prices continued its upward march on Monday, with diesel prices surging by 8 paise and 9 paise in four metropolitan cities. While Delhi and Kolkata saw a hike of 8 paise, a litre of diesel has increased by 9 paise in Mumbai and Chennai. After the revision of the rates, diesel in Delhi is being retailed at Rs 75.46 per litre and Rs 77. 31 per litre in Kolkata. In Mumbai, diesel touched Rs 79. 11 per litre mark, while the same is being retailed at Rs 79.80 per litre in Chennai. The Opposition has repeatedly blamed the Centre for the steep hike in the fuel price, while the latter has maintained that global crude oil prices and other international factors are responsible for the increase in prices of petroleum products.